I was raised on the East Coast where easy access to really good Chinese food was a way of life. Then I moved to Iowa. The only 2 Chinese places where I live are buffet style. They are not really anything to write home about. To get to any major city from where I live is a min. 90 minute drive. Kinda sucky, but these are the things we do for love! I do actually enjoy the small town life I have here, but sometimes I just NEED some good Chinese food! 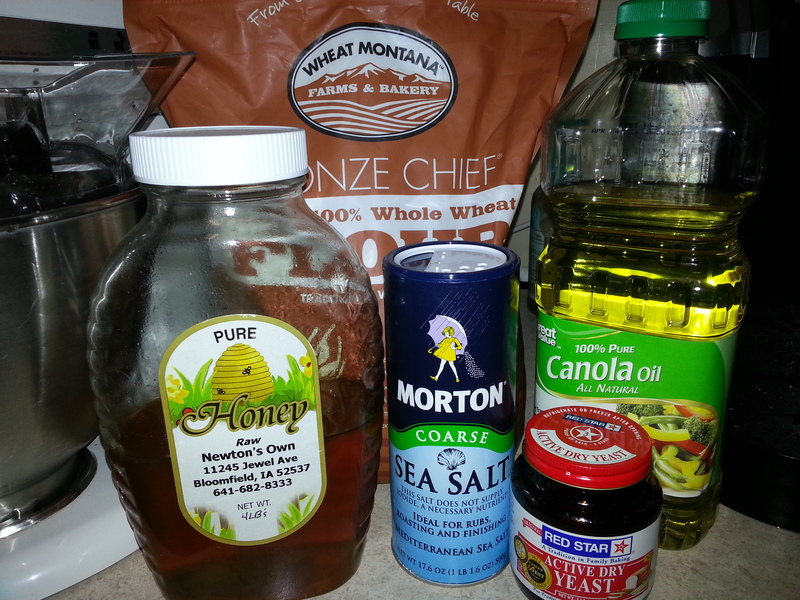 To be honest, this recipe is very time consuming, but so very worth it! I have a super picky fiance and he actually loves this dish so much that he is always willing to help me make it (bum hand, I always need help of some sort). This man does NOT know how to cook without me there to reassure him he wont burn down the house 🙂 but really he does quite well. There is nothing bad about this dish. Also, the leftovers are amazing! I hope you decide to try it. Be sure to let me know! I don’t know about you, but I cannot wait for spring and cookouts and bonfires and family gatherings and, WARM WEATHER!!!! I have never been a fan of potato salad mainly because I don’t like mustard. I know, I know, I must be insane. Still, it is just gross to me. Recently we ended up with far to many potato’s and eggs. Mom decided she would make a potato salad. Shocking enough I like it(of course she doesn’t use mustard!). This is such a basic recipe, but something about it just tastes so good. So if you have a picky no mustard eating family member, this is for you! Cut potato’s into small pieces and boil with eggs. Slice onion into very thin pieces and add to the boiling water. Salt the water. Chill eggs and potato’s in the fridge until cool. Mix eggs and potato’s with Helmans Mayonnaise, reserving a couple eggs if you want to decorate the top. 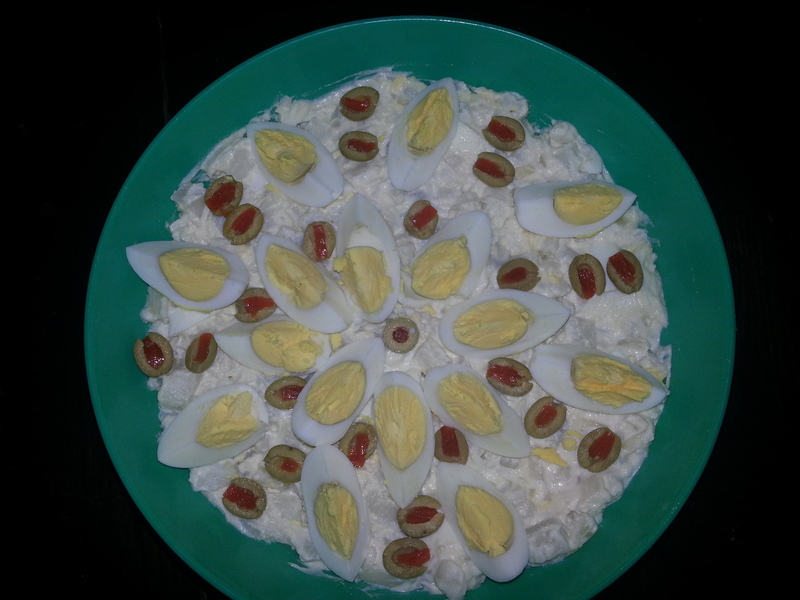 Slice eggs and olives into pieces and decorate the top if desired. Of course if you don’t like olives or prefer mustard you can always add or omit as you choose. The onions boil down to almost nothing and even my super picky fiance doesn’t notice they are in there. 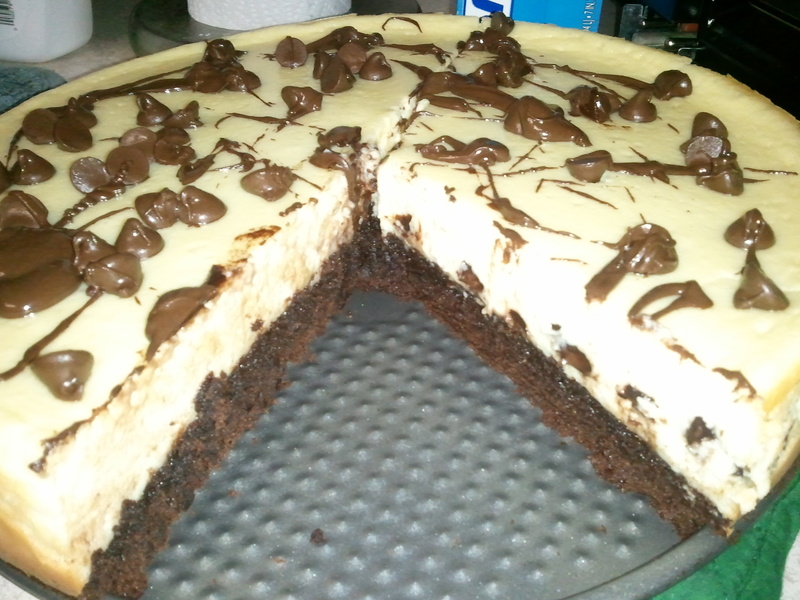 As always please let me know if you like the recipe! Enjoy! I don’t know about any of you guys out there, but I am finding it difficult to afford to eat better. 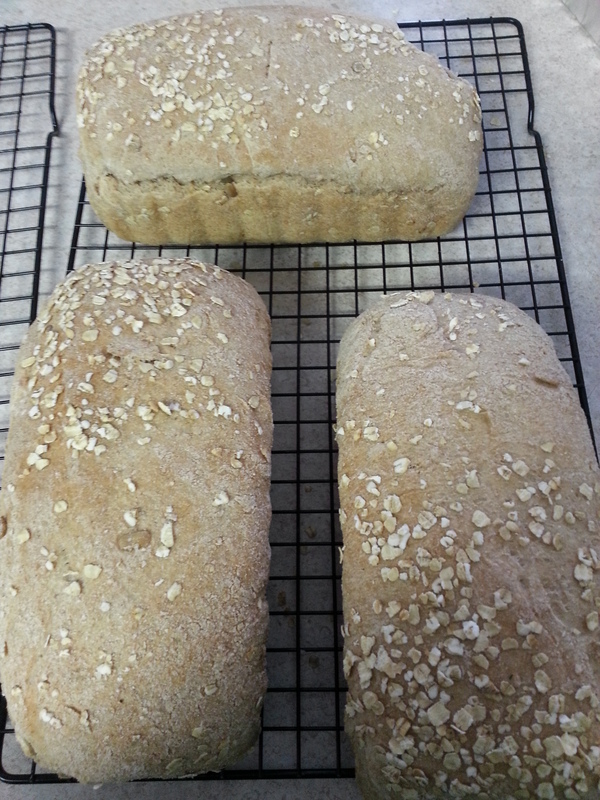 I have made some changes and found that making my own bread is a huge savings! Not to mention that it tastes so much better than store bought. I try to make this on Sundays and since it makes 2, I trade a loaf with a friend who has chickens and eggs. Easy peasy! I tried a few different recipes but this one from http://www.ourbestbites.com is by far the best. You do need to devote a afternoon to this process but for the most part its just waiting. The stand mixer does almost all the work, which for me is essential since I have very little use of my right hand. There is very little kneading to do, and that small part is done for me by my amazing fiance who has gotten quite good at being my kitchen helper! I really hope you enjoy this recipe. I have not had one person tell me they are not in love with this bread. Have fun and please let me know how it turns out! Ok so this has been waiting since Wednesday for me to write and post. Sorry, I’ve been out job hunting and it’s exhausting and between job fairs and a few interviews I’ve just been pooped lol. So! Make you’re bread dough! Split it in half. Set one half to the side and roll out the first half into a large rectangle. Get it pretty thin because it’ll double in size (thickness) in the oven. DO NOT ADD SAUCE! Add you’re toppings – I used cheese, pepperoni, sausage, and Canadian Bacon. Starting at one ‘short’ side of your rectangle start rolling 🙂 moisten your fingers with a little water to seal the end. Place on the cookie sheet to rest while you repeat with the other half of your dough. Cover your rolls with a towel and turn on your oven to 425 degrees. Once your oven is preheated (remove towel 😉 ) bake for 20 minutes. While they are baking put your sauce in a small pan to warm for dipping. 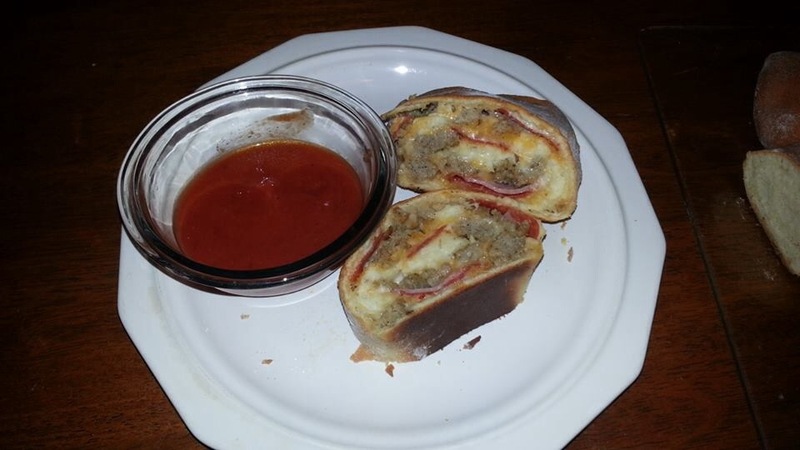 Once your roll-ups are done baking turn on the sauce to warm. Cut the rolls into slices about 1/2 to 1 inch. Serve with sauce and enjoy!!! Last night I was getting ready to make dinner – hamburgers and fries. Now I’m out of Everything right now so I knew I’d have to make the buns for the burgers. I pulled up this quick and easy recipe I’ve made before from http://www.tasteofhome.com/recipes/40-minute-hamburger-buns. While pulling out the ingrediance realized that I was out of eggs to 😦 . Well shoot what am I going to do? It’s too late to run to the store! Internet to the rescue! I looked up ‘egg replacements’ and I think I liked them better than with the egg in them! Try them and you may never buy buns again! In a small bowl slightly beat the egg or combine the ingrediance for the replacement. Prepare your mixer with the dough hook. Put the flour and salt in the bowl. When the Yeast mixture is ready add it and the egg (or egg replacement) to the flour and salt. Mix on medium for 3 – 5 minutes until a soft dough forms. Seperate into 12 rolls onto a greased or parchment covered cookie sheet. Yes they will seem small. Cover and let rise while your oven preheats (about 10 to 15 minutes). Preheat oven to 425 degrees and bake for 10 – 12 minutes (mine usually take about 11 lol) until the tops are a nice golden brown. Give them a few minutes to cool enough to handle. Hi everyone! Sorry I haven’t been posting theses last couple weeks, I’ve been trying to find a new job and I just haven’t stopped running 😦 , and my poor house is showing the results lol. But I decided to take a day off of running and spend it catching up on my house work and do a little in the kitchen – here is the result ;). The cold weather turns my thoughts to soups. The old standby that comes in a can works in a pinch but if you take a few minutes in the morning add in a crock pot and presto you have a yummy homemade soup that tastes great and was super easy! Ok so I’m gonna be honest. 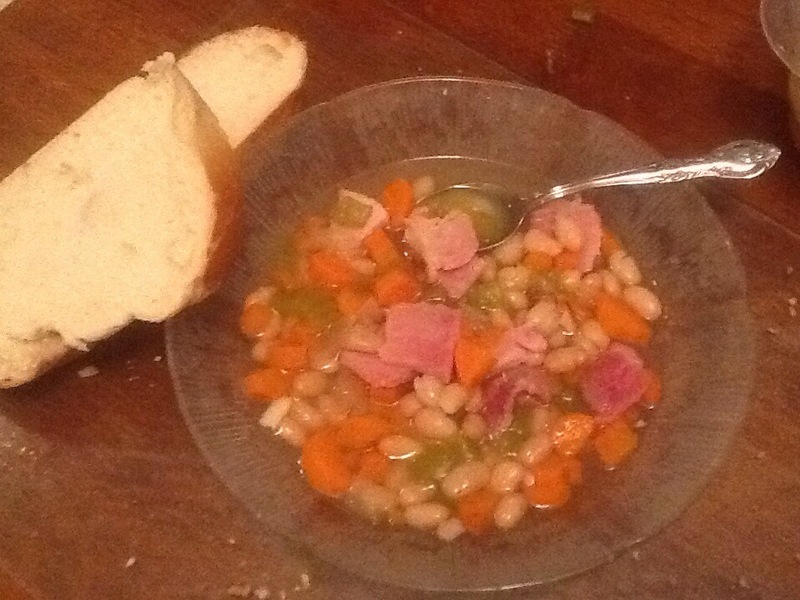 I’m NOT a bean eater normally but I love ham and bean soup! The combination of flavors……..YUM! In the morning place the first 7 ingredients in the crockpot and turn on low for 6 to 8 hours (or while your at work 😉 ). Add the ham and beans for about an hour – just long enough to heat through. Serve with a good crusty bread for dipping and enjoy. So for my job I work with people with intellectual disabilities. Basically I assist with skills needed to remain living on their own. I also do respite with a couple young adults. Today I was working with one of my respite kids whose 18th birthday happens to be tomorrow. One of the goals we work on is cooking so I gave her a few options for her birthday cake. 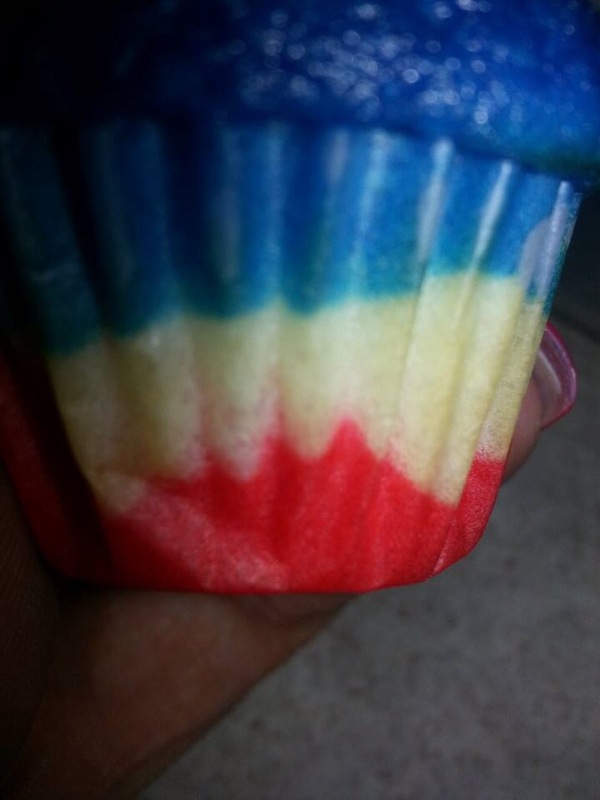 She chose rainbow cupcakes! 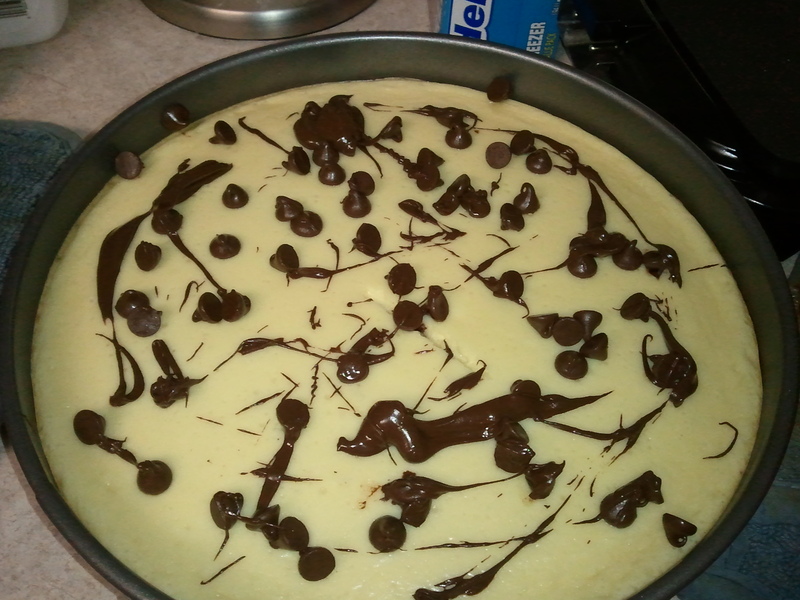 Basically its a super easy recipe since I used boxed cake mix. 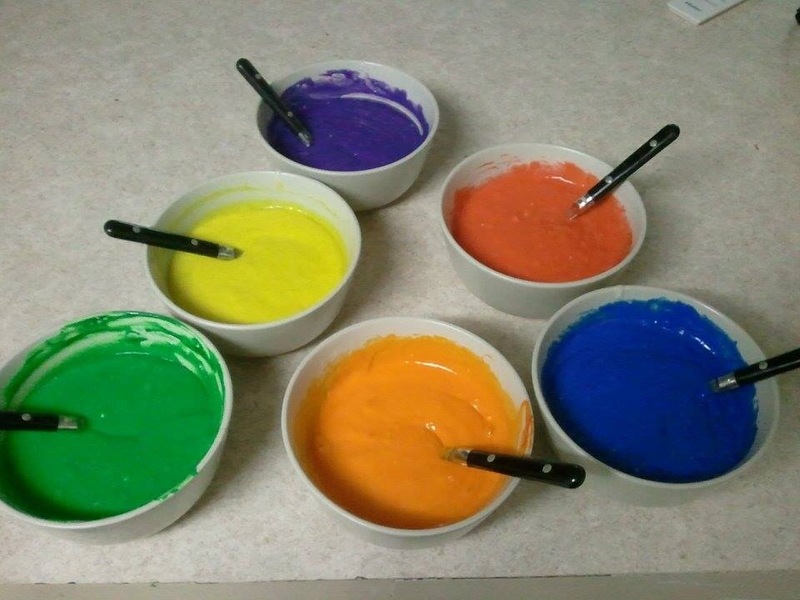 Prepare one white cake mix as directed and divide into 6 equal bowls. Add food coloring gel to each bowl with a toothpick and stir with a spoon. 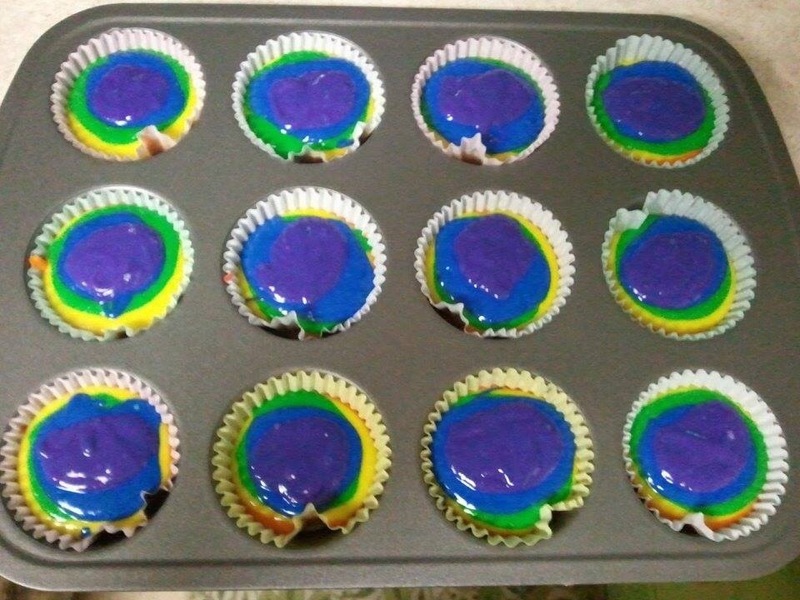 I use gel to avoid extra liquid in the batter. I bought mine at Walmart in the cake decorating isle. 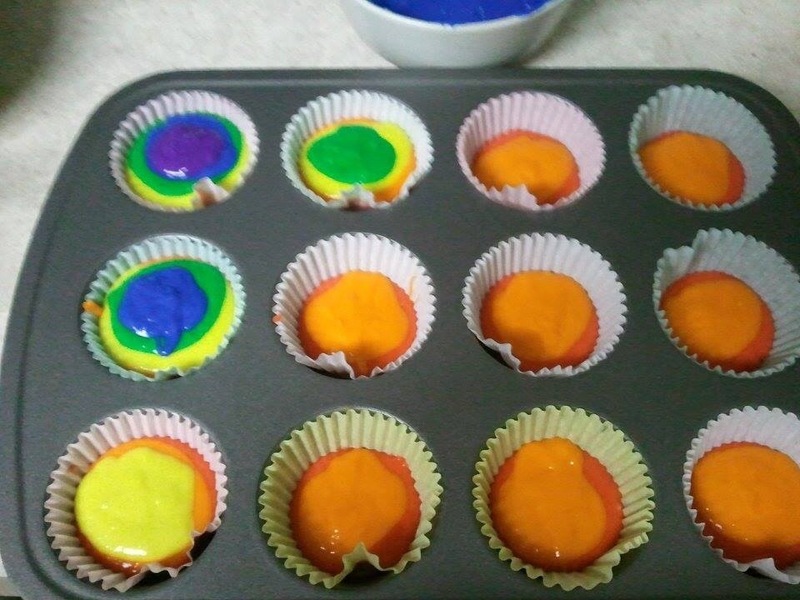 Put a teaspoon of each color in the cupcake liners. The batter doesn’t need to cover the whole bottom. It will spread out as you add the layers of color. Fill 2/3 with batter and bake as directed on the box. 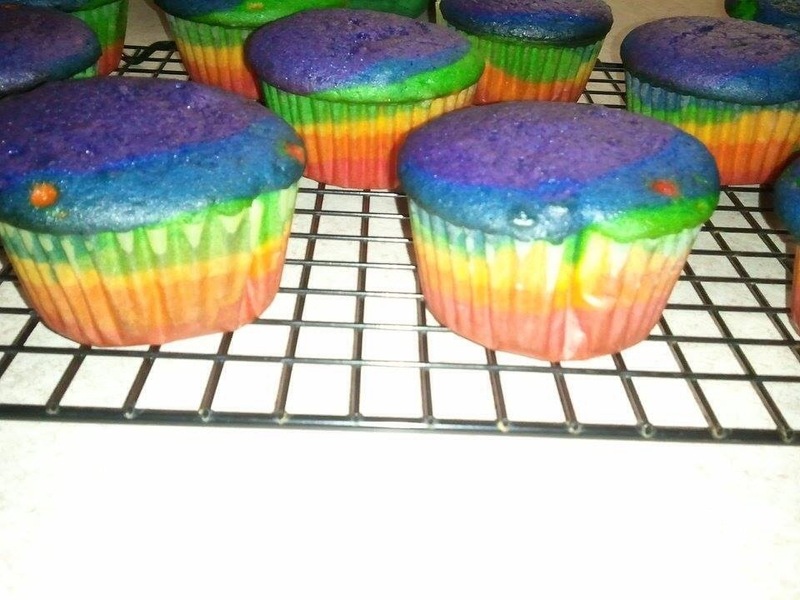 The end result makes for some colorful tasty fun! This recipe can be adapted to most any color scheme. Red white and blue for the 4th of July or black and white for your zebra loving teen. The possibilities are endless!